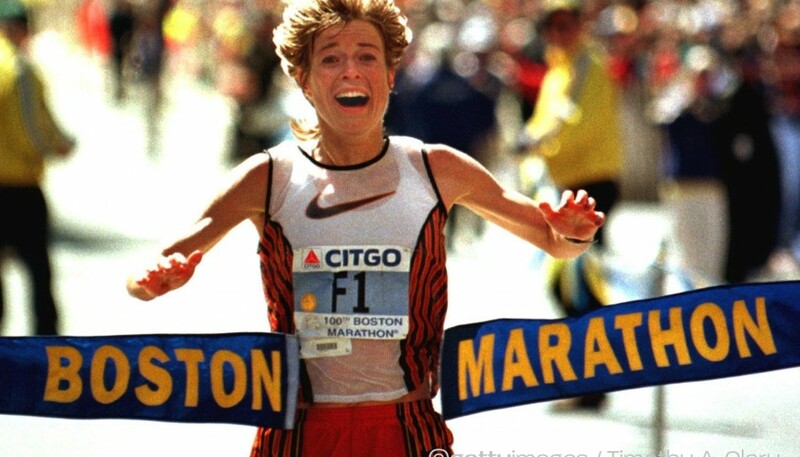 You could call the story of the 1994 women’s race at Boston “Love and Muscle”. The winner, 28-year-old Uta Pippig of Berlin, Germany, and Boulder, Colorado, demonstrated her love for the Marathon and the people of Boston—while displaying the muscle necessary to break the course record. Approaching the finish, Uta alternated between blowing kisses to the crowd and shoving her clenched fist into the air as she pointed at her biceps muscle. Uta was a joy to see. 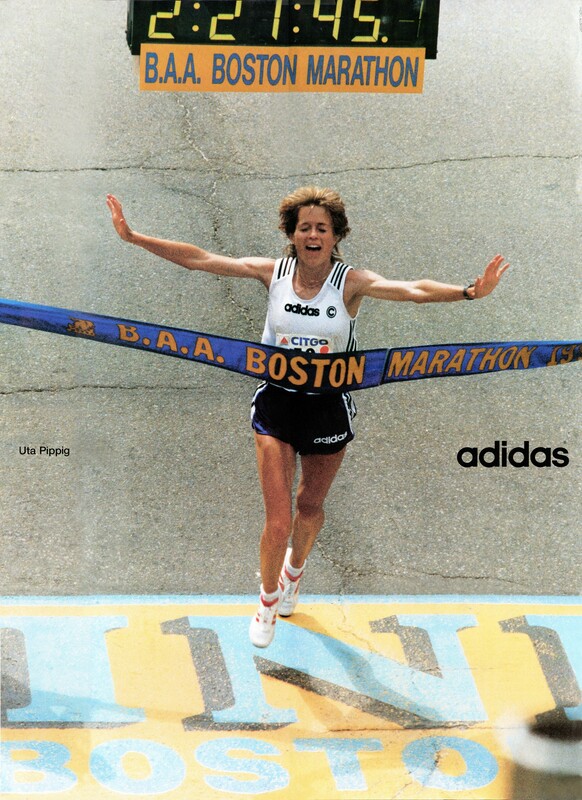 Her time of 2:21:45 bettered Joan Benoit-Samuelson’s record of 2:22:43 set back in 1983. By three miles, with Uta up front, the key players in the much-anticipated race were in position. Close on Uta’s heels strode defending champion Olga Markova of Russia, countrywoman and 1992 Olympic gold medalist Valentina Yegorova, Alena Peterkova of the Czech Republic (who had blitzed the Alamo Run a week earlier), and 1993 World Cross Country Champion Albertina Dias of Portugal. Also in the group were 1993 Falmouth winner Colleen de Reuck of South Africa and her much-heralded teammate Elana Meyer. The 1992 10,000-meter Olympic silver medalist, making her marathon debut after a recent 1:07:22 half marathon performance in Tokyo. Valentina Yegerova and two-time Boston winner Olga Markova traded fates from last year when it was Valentina who dropped out. 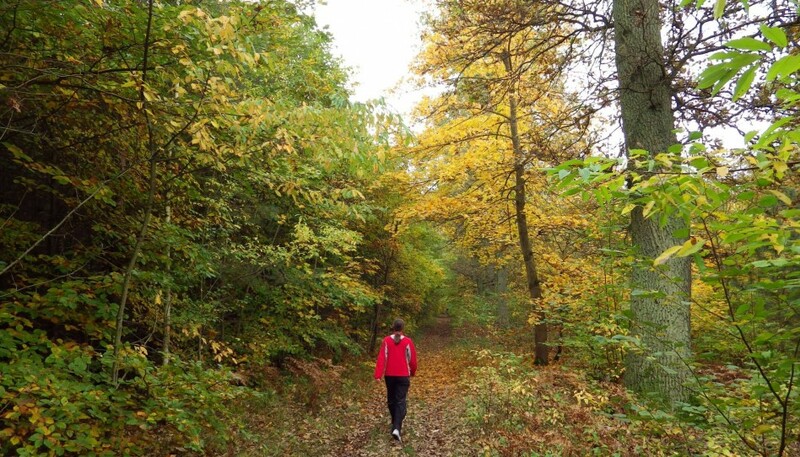 This year Olga stayed with the lead pack for about nine miles and dropped out at 20. Colleen de Reuck led through the six mile check point (32:20) with the pack close behind averaging 5:24 per mile. As they churned through the next several miles, various runners technically had the lead at specific check points. Uta led at seven and eight, Colleen at nine and ten. Ten miles passed in 53:56. 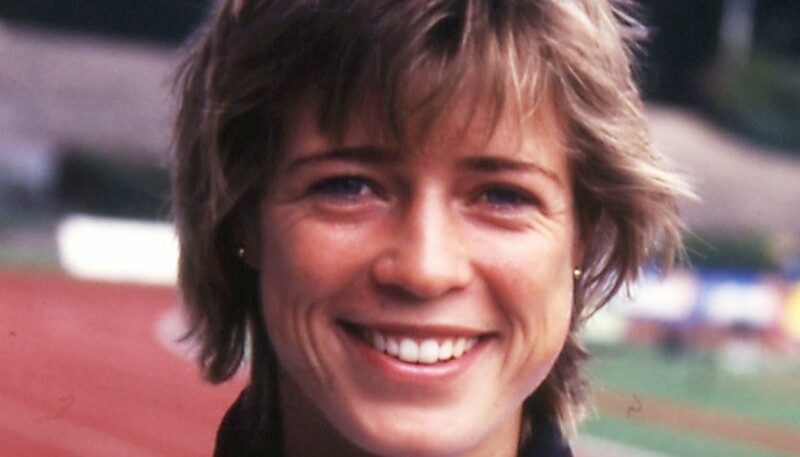 Joan Benoit’s split during her record run in 1983: 51:38. Over the next miles, when Uta put in a tiny surge, Valentina Yegorova would match it, with Elana Meyer merrily tagging along with a track runner’s kicking confidence and seeming to be having no trouble with the pace. The next miles passed in 5:30, 5:25, 5:23, with the half marathon mark reached in 1:10:48. Colleen de Reuck’s lead at this point was eight yards. Joan Benoit had run 1:08:22 for the half marathon. 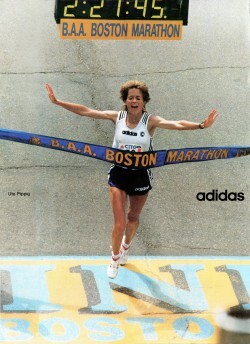 So, if you’d like to imagine the pack of ‘94 chasing Joan Benoit’s solo run of 1983, you can see them now 2:26 behind. This may perhaps help unterstand how Joan got her record the hard way—by going out fast and struggling in. By fourteen miles Uta and the pack had reeled in Colleen de Reuck. At fifteen miles Valentina Yegorova took a five yard lead. Then Uta took a big swoop down the hill into Newton Lower Falls with a 5:12 mile. She picked up fifteen yards on Valentina Yegorova and Elana Meyer, but she took long looks back as if to say she couldn’t believe she’d broken away so easily. The surge knocked off Colleen de Reuck. It should have knocked off Valentina and Elana, but Elana set off in pursuit and gained the lead by the 18-mile mark. Uta again upped the ante with a ten second increase in pace to 5:20. Elana Meyer looked to be floating along. Uta kept looking back. Elana and Uta ran close together with Elana usually behind. At times Uta would gesture to Elana to come up and share the lead. Elana refused. Uta kept looking back to check on Valentina Yegorova. At 19 miles, Uta opened a gap—and Elana could not respond. The little quick steps that had allowed her to close all the previous gaps would not come. She slowed dramatically. Uta passed 20 miles in 1:48:22. In 1983, Joan Benoit had passed here 1:38 earlier. Uta, now released from her shadow, flew away after the course record. She cranked out miles of 5:12, 5:18, and 5:10 while chasing Joant’s ghost. Her 140 mile training weeks paid off. The tailwind pushed her along. Somewhere along Beacon Street she caught the ghost. Valentina Yegorova, who had passed Elana Meyer at 40K, clinched second in 2:23:33. 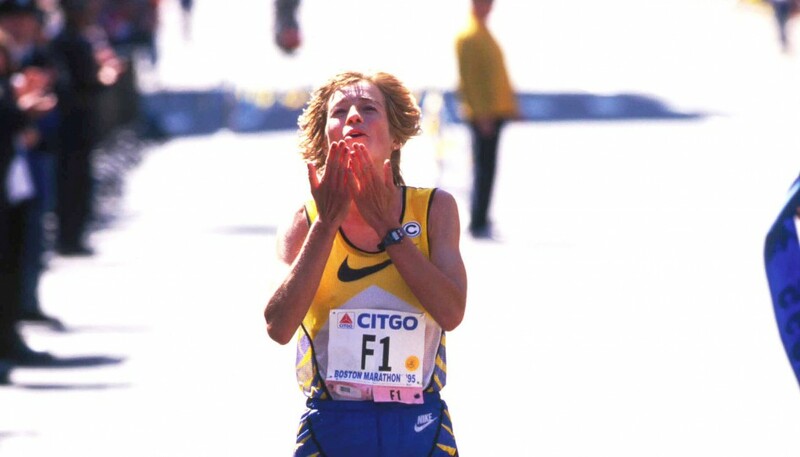 With a new marathon PR, down from the 2:26:40 run at Tokyo in 1993, Valentina Yegorova now had her day in the sun.